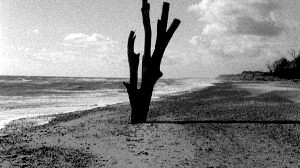 Patience (After Sebald) is a multi-layered film essay on landscape, art, history, life and loss – an exploration of the work and influence of WG Sebald, told via a long walk through coastal East Anglia tracking his most famous book The Rings Of Saturn. Also in there a list of the contributors in the film. It’s a dreadful film, traducing every one of Sebald’s careful meditations on the politics of representation. The final image of Sebald in a bush is an embarrassment and a travesty. Sebald, who was a devoted photographer, used images in his novels. Sometimes they were found objects, postcards, or something from an old newspaper. He was an exacting customer at the University of East Anglia copy shop, discussing what might be done with his images, adjusting the size and contrast. The photographs appear without captions and acquire meaning from the surrounding text. We read those enigmatic images through the story which Sebald provides, and then, later, come to the suspicion that they were something more (or less) than an illustration or documentation of the story. The way he handled visual images was characteristic of the way he wrote, determined not to make his point in an assertive way, but with implication and suggestion. Does a useful brief intro to the book with one extended quote.